OK, so our kids are the enemy...!? 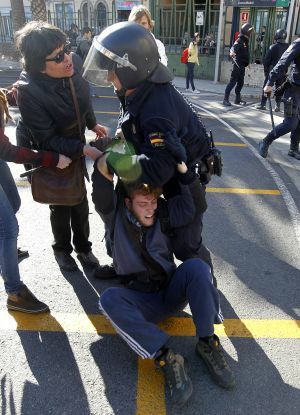 As the government announced that it will shorten salaries for teachers by 25% to reduce the public deficit, pupils of one institute of Valencia decided to have a protest sit-in (Valencia is the city where just the top 5 politicians robbed 40 Millions of public money with a 100% flowback to their own pockets to give it to some "Event organizers" - now all in prison - and who paid some 1.5 Millions to Mr. Urdangarin, the husband of the Kings daughter for "organizing a Congress" without the obligatory concourse - Matas: "...why a concourse, after all, he is the Duke of Palma..."). - 2nd, a press conference of Antonio Moreno, the Chief of Police in Valencia, who stated (with a decisive smack on his table): "If the enemy attacks, you have to show the enemy where your force lies. The enemy short cutted a vital traffic artery through the city, and -snip- we had to get the enemy off the street to open traffic again". Asked about the liver ruptures he re-iterated: "That is the way we train: A hit to the liver is the fastest way to take out the enemy" (the guy is still in charge, 3 days later). - 3rd: Our Minister of Interior (of Spain, not the region of Valencia), begs pardon for some "unfortunate actions of the police forces that might have occured", but 6 hours later rectifies: "We have serious data showing that the pupils were infiltrated by heavily armed radicals and attacking the security forces, and I was referring to *their* actions earlier..." (because in the middle of the two statements the Police Union had accused him of "politically coward and morally abhorrent" for "not closing files with the men and women who work for state"). 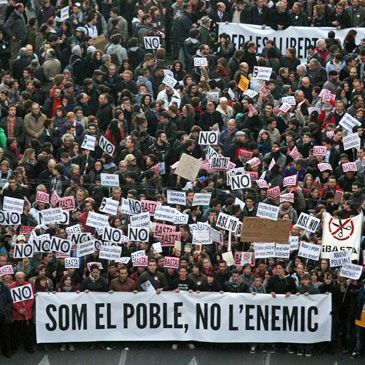 Suffice to say that today in Spain we have had between 500.000 and 2 Million people on the street (total, in all mayor cities, and it will be more on the weekend) claiming "These are our arms" with books in their hands. Re: OK, so our kids are the enemy...!? 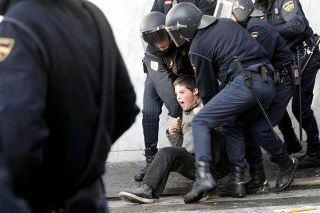 So the police in Spain can attack children? I am appalled I did not know this sooner, do they recruit from outside Spain? Sorry kids piss me off. As allways there are two sides. Were they allowed to demonstrate? Did any of those kids threw stones or other stuff we cant see on ther pictures to get the police angry? Normally police isnt equiped like this to remove children from the street. Only if you insist to see them. From my POV there are definite show stoppers to search for the other side. Luckily we live in a state form called "constitutional monarchical democracy" (like you in NL) where a constitution defines the rights that you dont have to ask permission for, Freedom of Expression (of thoughts, opinions and ideas contrary to the government e.g.) is one of them. No. But they held up books (I saw a "Descartes: Discourses part 2" with my own eyes!) which according to our minister of interior can be viewd as "lethal weapons" if you look at them from the other side (if you see two, that is). Indeed, but this was against "the enemy"... Just for the record and to save their honor, as they are the anti-violence police unit (National Police Unit) they always run around and go out like this. 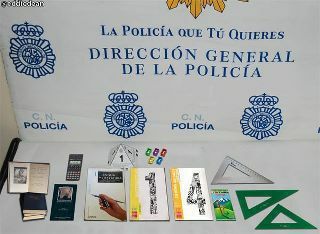 It is the official photo the Valencian (regional) minister of interior used to explain the police charge, not from a comedy show. All the uprisings around the Med have everybody nervous I would think. One sure way to make everybody nervous is to attack some kids holding a sit in. What is so frightening to governments when Kids sit down to protest something? It seems governments answer to that is to hurt them somehow. Various degrees of violence against them. The next thing that happens is the kids stop being peaceful and all hell breaks loose. Which I imagine is now getting ready to happen in Spain if it hasn't already. I do agree with the kids. Was just being a bit sarcastic about it. And the phone... communication can be more dangerous than weapons. Then allow me a bit of cynism, too: If we don´t have money anymore to teach them Maths (because we have to cut down a little bit to save our banks, nothing left for health or education), where do you think we will raise the dough to pay Close Combat teachers? Yes, definitely, and more so in this culture where kids are saints by definition. ...Kids sit down to protest something? It seems governments answer to that is to hurt them somehow. Various degrees of violence against them. The next thing that happens is the kids stop being peaceful and all hell breaks loose. Indeed, that is what we saw: First day they just detained a few 12 years old for obstruction of traffic, next day - when the manifestation went in contra of this act - all hell broke loose. I sincerely doubt that (for now and the near future). We will, of course, see a lot of street manifestatons of all kind of groups that are hurt by what our current (right wing) government has put out to reduce the debts we have with the international bankers. - An even longer culture to never say or do anything offensive (if not for outright and intentional provocation), coming from the 800 yrs of Arab ruling, deeply imprinted in the minds of everybody here (though only a minority is actually aware of tis being the reason). It is forbidden to say "no" to any request, you have to invent something less offensive, e.g. "tomorrow", or "I phone you and clear details" to state that you will not, under no circumstances whatever, do what your client/friend/adversary requests. - Seriously violent confrontations about politics or religion are a "no-no" here, the memories of the Civil War where brother fought brother, husband his wife, fathers their sons etc. is still too close to have been forgotten, many families, villages and the people as a whole remain traumatized: They know that when they start violence there wont be a limit. This said, should a violent reaction occur, there will be *no* liimits, also part of the culture (but as dogs still are around despite showing off every 5 minutes that they are ready to fight because agression has been ritualized, same occurs for the Spanish society, in this I think we are decades ahead of e.g. nations that have not had a Civil War recently). All this mentioned together makes it highly improbable (in the short term, no guarantees should a certain red line be crossed) that we will see a violent revolution here (15M might triumph, but violence would not be part of the scenario in this case). Nothing wrong with beating kids off the street, but dont you dare call them "the enemy", obligatory it is to call them "the future" and that difference is what made people mad right now. When I look to my daughter study, several things I did notice. Her school claims to be the same school I did in my youth. We have 4 grades ranging from A to D with D being the most difficult level. I did my study at D level. When I look at her math and nature and other stuff its only A and in some times B level. This worried me, at some extend schools are lowering their educational programs to get students.